Argentinean Eduardo Sepulveda (Fortuneo-Vital Concept) won the ‘queen’ stage of the 2016 Tour de San Luis in Argentina on Thursday. Sepulveda put in a lone move to take the stage four victory atop the twisting climb of Alto del Amago ahead of Janier Acevedo (Jamis) in second and Roman Villalobos (Costa Rica) in third. Sepulveda now leads the general classification ahead of Dayer Quintana (Movistar) by three seconds, and Rodrigo Contreras (Etixx-QuickStep) in third at 38 seconds. Nairo Quintana (Movistar) is fourth at 42 seconds. The stage started off fairly sedately, with a sizeable group of 12 riders forming a break over the relatively flat opening 100km. As the final climb loomed, and the bunch began to chase, the escape group was reduced to seven riders with 15km to go. With the break all caught at the foot of Alto del Amago, Astana, Etixx and Movistar at the front of the peloton and the pace was kept very high. Overnight leader Peter Koning (Drapac Pro Cycling) paid for the previous day’s stage-winning efforts and slipped out the back of the peloton before the final climb really got going. As the gradient ramped up, the strung-out peloton was constantly shedding riders and a compact group of contenders formed. Vincenzo Nibali (Astana) was another of those dropped, and would lose his overall top 10 place. Dayer Quintana was the first to launch a serious attack, moving clear of the bunch an opening up a gap of half a minute. He was joined by Acevedo with 6km to go, and then Sepulveda bridged over to the two leaders, and immediately rode on. Sepulveda continued his solo move, powering up the final section of the climb and onto the undulating final kilometre to take the win ahead of the chasers. The Quintana brothers, Dayer and Nairo, finished in fourth and eighth respectively. Friday’s stage five runs from Renca to Juana Koslay over 168.7km and features a short climb to the finish. 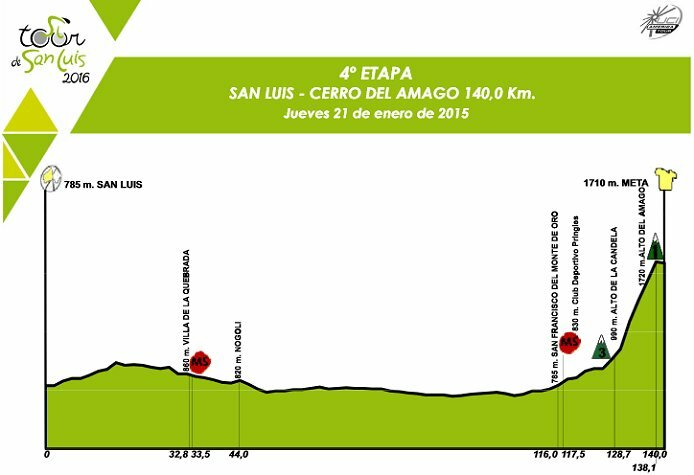 The 2016 Tour de San Luis concludes on Sunday, January 24.